A million things might be on students’ minds throughout the day, but National Hispanic Heritage Month challenges them to stop, think about and educate themselves on the Latino population, Lillian Casillas, director of La Casa Latino Cultural Center, said. 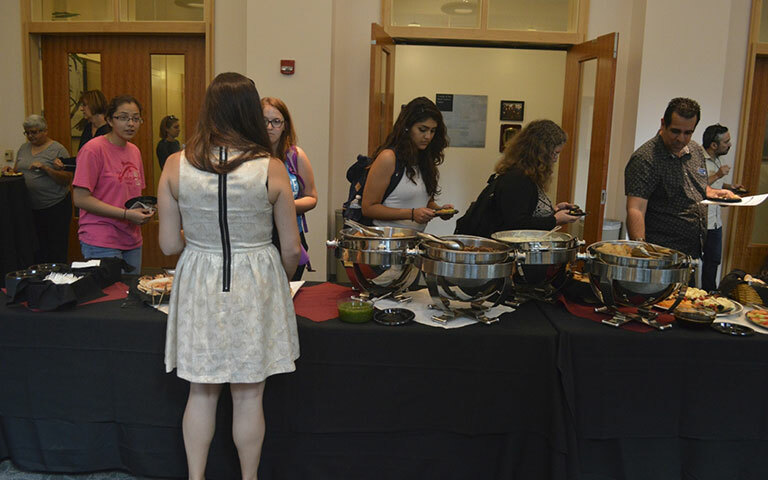 Students and faculty gathered Thursday to kick off National Hispanic Heritage Month with a reception featuring food and conversation. Casillas said she believes this conversation allows opportunities for awareness and recognition throughout the month, lasting from Sept. 15 to Oct. 15. La Casa, other student organizations, academic departments and Bloomington residents have come together to create an extensive list of events to educate students about Latino culture. The variety of groups celebrating National Hispanic Heritage Month can break down barriers between Bloomington residents and students, Casillas said. This creates not only a connection between the topic and the individuals but also a connection between individuals. “It’s something that we try to reach everybody because everybody has the opportunity to become connected with the community and everybody has the opportunity to learn something,” Casillas said. The month’s events consist of social gatherings, like the reception, film viewings, lectures and recitals. Casillas said she believes the variety of events will engage all audiences. For senior Carmen Tirado these events play a big role in the overall meaning of National Hispanic Heritage Month. She said she believes it is a good way for people who are unfamiliar with the culture to be informed. “I hope they can learn that Latinos are here, and we do want to make a difference in the world and bring knowledge to the community about our culture and heritage,” Tirado said. Casillas said the month is not only a way to educate others but also a way for Latinos to be educated about the history and the culture. Many Latinos are often not educated on these topics because Latino culture and history are not included in traditional high school courses. In the programs throughout the month, students will learn more about how the history and culture of Latinos has affected them, she said. “It may be pride, but it’s also self awareness and self-learning,” Casillas said. She describes the awareness as knowledge of current issues affecting the community and the history of Latinos. She said she also believes the recognition of contributions and diversity within the Latino population are important. Sophomore Olivia Martinez attended the reception and said she also believes in the goals of National Hispanic Heritage Month. “It’s recognizing and learning about our history and commemorating the people that have brought us to this moment,” she said.